Demolition is as much an art as it is a science, and involves many elements, including recycling, salvage, restructuring, and other complex tasks. Interior demolition involves demolishing only selected sections of a structure to prepare for remodeling or renovation. This is particularly helpful for businesses that wish to expand or update an office or other workspace. 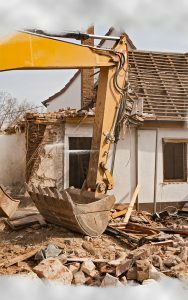 Professional demolition services also specialize in relocating or removing large objects such as dumpsters, refrigerators, storage containers, and other objects that are difficult to transport. Many businesses lack the manpower or proper equipment to remove such objects safely. A major benefit to hiring a professional to perform the above-mentioned tasks is that those who perform demolition services must adhere to very strict guidelines set forth by not only individual states, but by the Federal Government’s Occupational Safety and Health Administration, or OSHA. In fact, OSHA’s Construction Standard includes a specific section on how to properly carry out demolition operations. This ensures that everything is handled in the safest and most efficient way possible. Demolition services are particularly useful if you’re a business owner who has just purchased a property and you need to restructure it for another purpose. An interior demolitions professional can remove unwanted items from the building, restructure rooms, or anything else that may be required to transform the space to better suit your purposes. They can also safely perform asbestos removal, if required. Asbestos abatement is a highly-regulated process with specific disposal requirements. Hiring a professional company for all of your demolition needs will ensure that all tasks are performed according to strict regulations and that nothing is overlooked. This will greatly benefit your business in the long run, especially in the case of expanding or updating a space so that your business can grow. You can avoid costly fines and have peace of mind so that you can focus on what you do best – growing your business.